With the help of the Middle Tennessee Mule Skinners Association, Cannon County Sheriff Darrell Young is well on the way to having a garden planted in a field next to the sheriff's department. 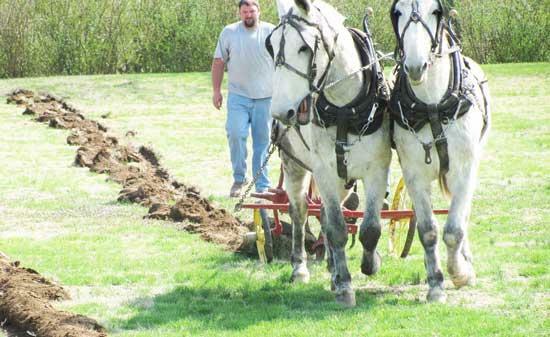 Members of the Mule Skinners, including Buddy Black, Trent Hancock, Terry Preston, Grady George, Jr. and Wayne Hancock, plowed the field with a team of mules this past Saturday. Sheriff Young said vegetables to be planted include green beans, okra, spinach and cucumbers. The vegetables will be planted by inmates, Sheriff Young said. Inmates will also be the beneficiary of their labor, as they will eat the food they grow. The Middle Tennessee Mule Skinners have been very active since 1997. The MTMS Annual Mule Show held in Woodbury has grown to be recognized as one of the best shows in the South East. MTMS sponsors and organizes seasonal activities such as wagon rides, plowings, mowings, parades and sales as well. MTMS members have build a reputation by participation in the Columbia Mule Day Parade. For the past 35 years, member Buddy Black has carried the Grand Marshall of the parade in the number one wagon in the parade. Member Thomas Summers following, in the number two wagon, with the Columbia Mule Day Queen and her court. During 2009 the MTMS were well represented as the number three wagon driven by Andrew Duggin and Jimmy Simpson carried all of the past Mule Day Queens and in 2010 they provided transportation for the Mayor of Columbia and his family. During 2010, David and Jackie Preston, Trent Hancock, Andrew Duggin and Bob Cantrell attended the Ellington Agricultural Music and Molasses Festival in Nashville, Tennessee. During this Saturday visit, three teams of mules provided wagon rides to over 5000 people at the festival. Thomas Summers also was a big hit at Heritage Day on the Mountain during October 2010 as he gave rides to visitors on a trolley with a four mule hitch (pictured below). Thomas and his team provided rides to over 2000 riders during the one day event held at the historic farm of Jimmy Yates on Rocky River Mountain. This is a good program instead of sitting in jail under airconidionerI don't recall the last sherriff doing this the inmates need to work some of them have probably never worked before. GOOD JOB SHERRIFF YOUNG!!!!!! Glad to see we are having a large garden at the Sheriff’s Department and the Inmates will have the fruits of their labor...teaches responsibility and gives them the encouragement to do better and realize life can be good and it is what you make it! Now all we need is to put them in pink underwear, feed them bologna and water, let them sleep in tents and make the stay as uncomfortable as possible. Should take a page from the book of Sheriff Joe Arpaio of Maricopa County in Arizona. The majority of people that come into that jail are repeats. They do nothing in life but try to figure out how to cause trouble and be a drain on society. I know in the real world this will not show them any kind of responsibility at all, but hey at least it helps to slightly reduce the cost of housing ... uuuhhhhhmmmmmm "These pitiful misguided human beings that lurk in the dark hollows of society". Good luck Darrell and work them till they are too sore to lie, cheat, or steal for the rest of society. making and selling drugs. Not to mention stealing with minimun punshiments the sheriff can only do so much. He has made improvements cutting down on expenses to the county. Glad to see the garden program back in effect, great move. Thank's to the Mule Skinners Members for helping. I think you are doing a GREAT job Darrell, keep it up.